I have been a huge fan of matte polish since the look first arrived on the scene. I paid something like $22 for my first matte polish (KnockOut Cosmetics Flatte Black), just because I thought the whole matte concept was so cool. Back then, mattes were not easily found, so KnockOut Cosmetics was one of the few options. Now, mattes are all over the place and they're really back in a big way this fall. SinfulColors Leather Luxe collection features gorgeous matte polishes for just $1.99. 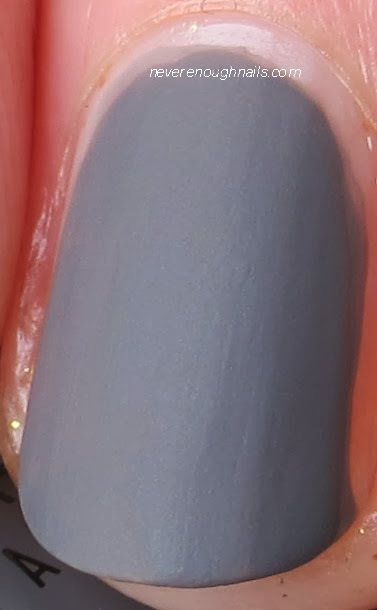 This lovely medium gray matte is SinfulColors My Turn. Despite having a large collection of matte polishes, I don't own a gray matte, so I am pretty excited about this. My Turn is the perfect shade of true gray, not too cool and not too pale either. This is two coats of My Turn with no base or top coat. Mattes are occasionally difficult to apply, but the application of this one was pretty good. If you've used mattes before, you know you have to work quickly to apply the polish smoothly before it dries, but I didn't feel that My Turn dried too quickly during application. Overall, I am a big fan of this polish! SinfulColors My Turn is available now at a drugstore near you!